I never got to see Comiskey Park before it was replaced by New Comiskey, and I still regret that a bit. But I was just 13 in the summer of 1990, and Chicago is a long way from New Jersey. There was no way to get there on my own, and our family trip that summer was to California, so Dodger Stadium was the ballpark away from home that I got to visit. But a year later, I did get to see Baltimore’s Memorial Stadium in its final year. As with the Rangers-Red Sox game at Fenway in 1993, the foursome of myself, my friend Matt and our fathers made the trip. It was a one-day jaunt down to Baltimore and back, about a 3 1/2-hour drive each way, not counting the time spent sitting without moving in the parking lot after the game. With the stadium jammed into a neighborhood, parking was limited, so cars were just lined up in the lots around the ballpark, as you can see in the photo on this page. We weren’t in too deep, but we did have to wait for at least one car to move before we could depart, and the owner of it didn’t leave the game as quickly as we did. Other notable moments from the day: We saw Mo Vaughn’s first Major League home run, I was definitely psyched to see Cal Ripken play (you’ll notice his batting stance in one of the photos) and Wade Boggs struck out. I found this last one notable because, a week earlier in Boston, I’d seen Don Mattingly strike out, and neither did so all that frequently. The next year, we went to Camden Yards in its inaugural season, and the differences were immense. Of course, Oriole Park is noted as the beginning of the “retro ballpark” trend, but in addition, it also marked a shift from building stadia on the outskirts of town to finding room in or near the heart of downtown. Or at least more accessible to the city itself and its public transportation. In some ways, it can be seen not only in Baltimore, but San Francisco, San Diego, Cleveland and Houston, just to name four off the top of my head that I’ve visited. 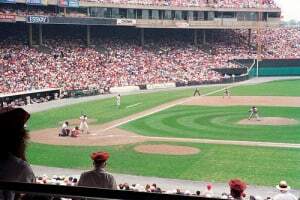 The drive to Memorial Stadium on the city’s east side included a civics lesson, while a visit to Oriole Park is as much a tourist destination as the nearby Inner Harbor.